If you can afford to make a donation to cover the cost of a pack of Awá campaign stickers, please complete this form and we’ll mail them to you. If you would like stickers but can’t afford to donate, please e-mail us with your mailing address and we’ll send some out to you. Survival accepts no money from any national government, so our work relies on supporters just like you. You can make a quick, one-off donation by PayPal without filling out any forms. You are donating to cover the cost of Awá campaign stickers. Note: PayPal only accepts recurring donations with a credit card. Please use the 'debit' option if you prefer to use your bank account. In the next step, we will forward you to PayPal where you can log into an existing PayPal account or pay using your crebit or debit card. 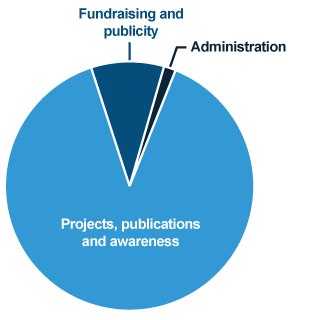 Our resources are allocated to our educational, research and outreach work, with very little spent on administration. All donations from individual Survival supporters go directly to work for threatened tribal peoples. Income from past gifts covers all fundraising and administration costs. Our accounts are audited to the highest standards; a summary is published in our annual review.